What is the best way to treat opioid addiction? Helen Baghdoyan, professor in the department of anesthesiology at the University of Tennessee, looks into this question. 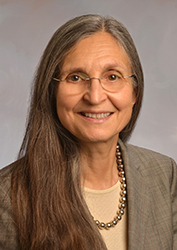 Helen A. Baghdoyan is a Beaman Professor at The University of Tennessee in Knoxville where she serves as Professor of Psychology and Professor of Anesthesiology at the University of Tennessee Medical Center. She holds a joint appointment at Oak Ridge National Laboratory. Dr. Baghdoyan received her PhD from the University of Connecticut in Neuropsychopharmacology. She completed postdoctoral training and held a junior faculty position in the Department of Psychiatry at Harvard Medical School. Her NIH-funded research program has identified neurochemical mechanisms and brain regions regulating behavioral states such as sleep, wakefulness, and anesthesia. Her neurochemical studies identify neuronal circuits regulating sleep, anesthesia, and pain. Her research relates to health in that disturbed sleep exacerbates pain, and the opioids prescribed to treat chronic pain cause sleep disruption. Dr. Baghdoyan is committed to science education, and numerous undergraduate, graduate, and post-graduate scholars have earned co-authorship on her papers. At the University of Michigan, she received the Distinguished Clinical and Translational Research Mentor Award. She co-developed with Dr. Ralph Lydic and the University of Michigan Center for Academic Innovation the online course entitled “Sleep: Neurobiology, Medicine, and Society”, which has been completed by more than 30,000 learners. Significant pain is a fundamental human condition that will always require medical management. When clinically administered, opioids such as morphine and fentanyl are standard-of-care for relief from significant pain. Opioid use disorder is a complex disease and a national crisis. The prevalence of this disease means that many of us now have an affected family member or friend. The U.S. Surgeon General is helping to decrease the stigma by publically describing how this disease has impacted his own family. There are only three drugs approved for treating opioid use disorder. Two of these drugs, methadone and buprenorphine, are themselves opioids and the third is the opioid receptor blocker naltrexone. For some patients, these drugs have the desired effect of decreasing opioid craving. However, recovery is a long and difficult process requiring an addiction specialist along with peer and family support. The major cause of opioid-related deaths is respiratory failure. For morphine and fentanyl, the higher the dose, the greater the respiratory depression. Although buprenorphine does not cause the same dose-dependent respiratory depression, we have recently discovered that buprenorphine decreases the ability of mice to vary their breathing. Respiratory variability is required to increase frequency and depth of breathing during exercise, stress, and highly emotional events. These findings in mice encourage similar studies in humans. Social and economic research describes opioid use disorder as a disease of despair. To the extent that this is accurate, the opioid crisis will be with us for many years.